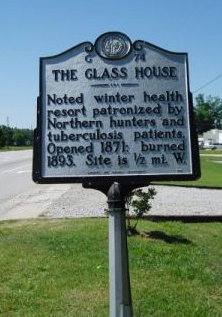 The Glass House, formerly located on the west side of the old Raleigh & Gaston (later Seaboard Line) Railroad near the town of Kittrell in Vance County, was the popular name of the first winter resort in North Carolina. Not to be confused with the Kittrell Springs Hotel located about one-quarter of a mile away (probably the first summer resort in North Carolina), the Glass House stood outside the perimeter of the springs and retained a distinctively separate history. Washington Franklin Davis bought the old Collins Hotel in 1870 and began a massive rehabilitation. When completed a year later, the structure stood two stories high and accommodated 100 guests. Glassed-in porches on the east and south sides of both stories displayed potted plants and hanging baskets, giving the building a unique showcase appearance. Officially named the Davis Hotel, the building soon acquired the nickname "Glass House." Originally from Boston, Davis maintained his New England ties by buying supplies and equipment exclusively from northern merchants. His amiable personality, charitable nature, and outgoing manner earned him community respect and the affectionate title "Yankee" Davis. While the Kittrell Springs Hotel catered almost exclusively to southerners, the Glass House served as a haven for northerners. Hunters brought servants, horses, and dogs, the boarding of which generated additional revenue for the hotel. The sportsmen returned home with stories of the sun-washed openness of Davis's unusual hotel, as well as the picturesque setting, salubrious climate, and abundant pine trees that allegedly gave curative value to the North Carolina air. The hotel also attracted tuberculosis sufferers seeking relief from cold northern winters. Although not strictly a tuberculosis sanitarium, the Glass House offered limited patient care, at one time employing seven French nurses. The large glass windows provided much needed sunlight, the porches afforded exercise areas, and hair mattresses allowed more comfortable sleeping. The Glass House filled with hunters and tubercular patients annually from October to May. Indoor activities included dances, billiards, bowling, drama, card games, and a reading library, while guests enjoyed horseback riding, hunting, and walks in the sunshine outdoors. Music sometimes came from a traveling orchestra but most often from the talented fingers of Mrs. Joe Person on the piano. In the early morning of 29 Apr. 1893, the Glass House caught fire and burned; all of its contents were destroyed, but fortunately there was no loss of life. The fire ended the hotel's 22 years of service during the "Golden Age" of spas, healing springs, and health resorts in North Carolina. Samuel Thomas Peace, "Zeb's Black Baby," Vance County, North Carolina: A Short History (1956). The Glass House NC Historical Marker G-74. Available from http://www.ncmarkers.com/marker_photo.aspx?sf=b&id=G-74 (accessed June 13, 2012).